Last week, animal rescuers in Australia got an unusual phone call from a furniture store. 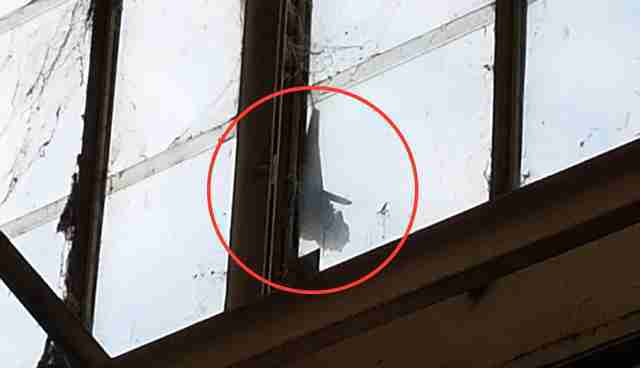 A flying fox - a large type of bat - had been spotted hanging off an outside wall, just underneath the shop's window. 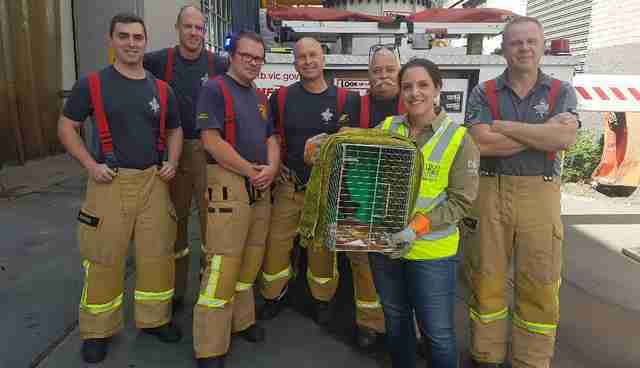 Amy Hidge, a veteran volunteer with the rescue group Wildlife Victoria, drove to the scene as soon as she could. But when she arrived, and saw how far up on the building the flying fox was stranded, she knew she'd need some reinforcements. Luckily, the Metropolitan Fire Brigade was able to come to the rescue, and give Hidge a lift on a cherry-picker. When Hidge reached the flying fox, she saw that his tiny nails were wedged between the metal plate of the window and the glass. With a few wriggles, Hidge was able to pull his nails out and tuck him into her arms for safety. "I could tell right away how appreciative he was," Hidge tells The Dodo. "They're the most amazing creatures - so intelligent and special." The firefighter who accompanied Hidge on the cherry-picker was nicknamed Finny, so Hidge thought it would be appropriate to name the flying fox after him. Since Hidge wasn't certain how long Finny had been stuck to the wall, she bundled him up in a fluffy towel and arranged for him to go into rehabilitation with a wildlife foster carer. Before he went anywhere, however, Hidge made sure this adorable little creature had a nice long drink. Using a syringe, she fed Finny blackcurrant juice, which he clearly seemed to enjoy! Besides being incredibly cute, flying foxes play an essential role in the Australian ecosystem. They feast on nectar, pollen and fruit, and their eating habits help regenerate forests and distribute pollination. In fact, flying foxes are considered "keystone" species because so many animals and plants depend on their survival and well-being. 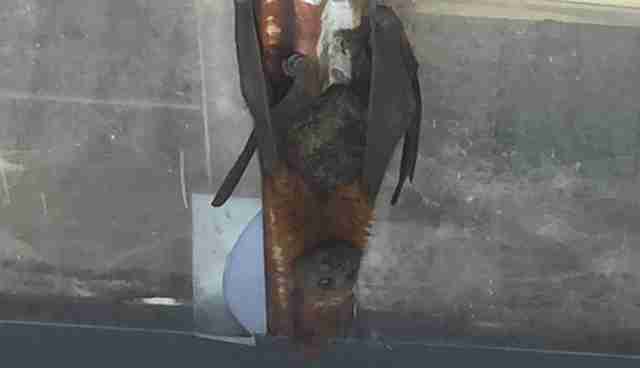 There are four main species of flying fox in mainland Australia - black, grey-headed, spectacled and little red. Finny is a grey-headed flying fox, which is listed as a threatened species in Victoria. 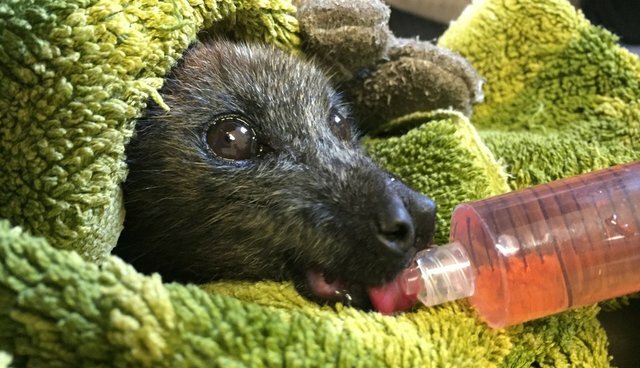 Unfortunately, flying fox populations have been rapidly declining in recent years, with some species experiencing 95 percent losses in the past 30 years. The causes include habitat destruction, disturbance, starvation, increased heat events, and illegal and legal shootings, as well as entanglements in barbed wire, power lines and backyard fruit tree nets. "While Finny's entanglement was a little unusual," Hidge explains, "we mainly receive reports when they are tangled up in netting loosely thrown over fruit trees. The poor things don't see the netting as they are flying over at night and get themselves all tangled up, often ending up with fatal injuries." To watch Finny's full rescue, check out this video. 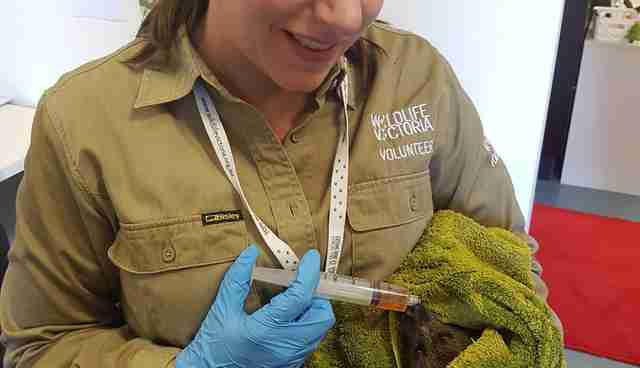 If you'd like to help creatures like Finny, please consider supporting Wildlife Victoria. Also, if you live in Australia, and you have fruit trees, consider getting a wildlife-friendly net!